North America (May 15, 2017) – As Iron Maiden suits up for the North American leg of its The Book of Souls World Tour, Artisanal Imports announces a new draft initiative for the band's beloved beer TROOPER, supported by a stunning new 3D tap handle featuring mascot “Eddie”, broader U.S. distribution and a fan photo contest. TROOPER will soon be pouring all over the country, including many states where it has never been sold before, to meet a dramatic increase in demand. Most tour venues, hundreds of surrounding bars and designated TROOPER Bar Alliance locations will carry TROOPER to ensure fans don’t go thirsty. The golden elixir will pour from a special limited-release 3D tap handle featuring Maiden’s renowned mascot Eddie, a legend in his own right. The stunning 3D handle is not available for sale, but fans have a unique opportunity to win one by entering the “Win An Eddie Tap Handle Photo Contest” located on the TROOPER Facebook page. Iron Maiden's American voyage kicks off in Bristow, VA on June 3, and culminates in a July 22nd appearance in Brooklyn. For more info on the band, their tour and beer, head to http://ironmaiden.com. TROOPER is an award-winning premium British Extra Special / Strong Bitter (ESB) styled beer inspired by Iron Maiden and handcrafted at Robinsons Brewery located in Stockport, United Kingdom. Malt flavors and citric notes from a unique blend of Bobec, Goldings and Cascade hops dominate this deep golden ale with a subtle hint of lemon, which has helped this ale sell millions of pints around the world since its 2013 inception. Robinsons Brewery has been based in the heart of Stockport for almost two centuries. With 300 tenanted and managed pubs, inns and hotels across the North West, it is one of oldest and most respected names in British brewing. 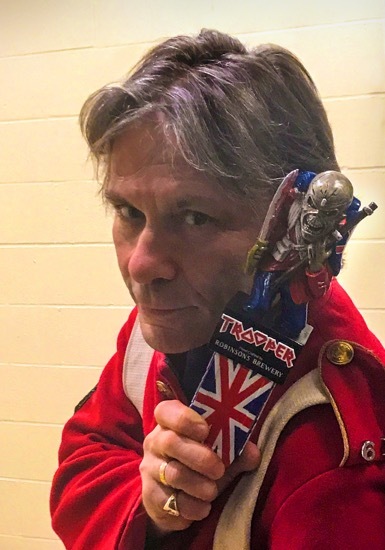 Interested in becoming a TROOPER Bar Alliance member and / or selling Iron Maiden’s TROOPER at your restaurant, bar or retail store? Interested in carrying the new 3D Eddie tap handle? Questions about the “Win An Eddie Tap Handle Photo Contest”? Please contact Lanny Hoff by email at lanny.hoff@artisanalimports.com. About Iron Maiden: With over 90 million albums sold worldwide, Iron Maiden is considered one of the most successful heavy metal bands in history, having played over 2000 live shows internationally throughout a career spanning over four decades. Iron Maiden’s famous mascot, "Eddie", has been a steadfast figurehead over the band’s 16 studio albums, the most recent of which is their first ever double and topped the chart in over 40 countries. For more information on the band, their tour and beer, head to http://ironmaiden.com/.